Size: 9" x 15" x 3"
Relax and unwind in the tub or spa with the luxuriously soft honeycomb bath pillow from Supracor. Perforations in the honeycomb cells on the Stimulite Bath Pillow circulate air and evaporate moisture so you stay cool and comfortable. Two suction cups adhere to the side of the tub, keeping the pillow in place.Water flows through the perforated cells, allowing the Bath Pillow to dry quickly. The Stimulite Bath Pillow naturally resists mildew! 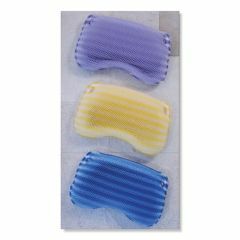 The Supracore Stimulite Bath Pillow is now available In: lavender/white, gold/white or blue/white.